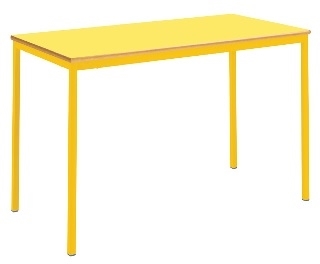 Colour Collection Fully-welded, spiral-stacking rectangular classroom tables in a range of sizes, which come with a solid 18mm MDF high pressure laminated top, and in a range of 7 vibrant laminate colours. Available in 6 heights to suit ages 3 through to adult (see below). 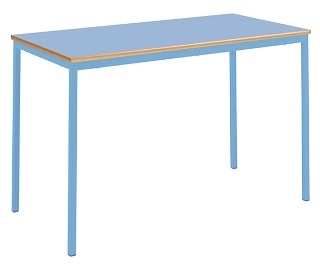 This table/desk will suit any school classroom, or other educational and learning environment. 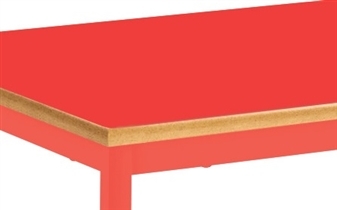 The tables come with a rounded bullnosed MDF edge. Each table has a sturdy steel frame which comes in a choice of 7 vibrant colours which you can mix and match for a fun classroom space. THIS MANUFACTURER WILL NOT DELIVER TO DOMESTIC ADDRESSES. & APPLIES A SURCHARGE FOR QUANTITIES UNDER 6 CONTACT THE OFFICE FOR DETAILS.